A New Jersey woman who held the title of oldest living American passed away last Sunday at the age of 114, leaving behind the remarkable distinction to another woman from Pennsylvania. Born in 1902, Adele Dunlap spent a lifetime in New Jersey and witnessed nearly the entirety of the American Century. 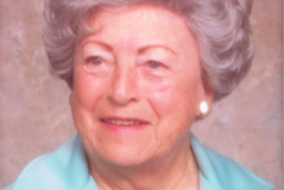 She grew up in Newark and spent her later years as a socially active senior at the Jersey Shore before moving into the Country Arch Care Center in Pittstown, according to an obituary published by Martin Funeral Home. Peers described Dunlap as "very witty" and a "local celebrity" at Country Arch. On her 114th birthday last December, after residents sang her "Happy Birthday," the one-time teacher and lifelong homemaker, a mother of two sons, was asked what she was thankful for in life. "Gee, how should I know?" Dunlap responded, according to The Record. "I've never thought of such a thing. I don't wish for anything." The Gerontology Research Group, an organization that tracks supercentenarians worldwide (ironically, its director's name is Robert D. Young), confirmed that Dunlap was the oldest living American at the time of her death. She assumed that title last July following the death of 113-year-old Massachusetts resident Goldie Michelson. Her helm is now occupied by 113-year-old Delphine Gibson of Huntingdon County, Pennsylvania. Worldwide, the oldest living person is 117-year-old Emily Morano, of Italy, who is the last living person on earth born before 1900. On her birthday last November, she said that the secret to her longevity has been biscuits with milk or water for breakfast.